These economical toilet paper rolls provide the perfect solution for public restrooms utilizing standard-roll dispensers. 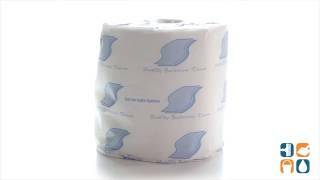 The soft paper is gentle on the skin but durable and absorbent. Strong and reliable, it's the perfect choice for high traffic restrooms but works well in residential homes too. Each roll is 2-ply and has 420 sheets that are 4.5" x 3" in size. Includes 96 individually wrapped rolls. Order yours today. Buy in bulk for your business and save even more!